a room fit for a furry - page 2 - lifestylers - Furtopia | Family Friendly Furry Forum and IRC Chat! Now that I have moved...my room is a little more on the normal side. 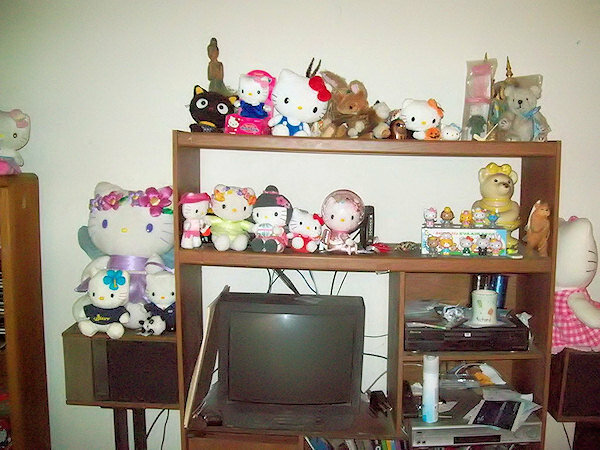 Only brought a few of my plushies, and my little stone animal collection, and that cat blanket. No posters or piles of plush or whatnot. 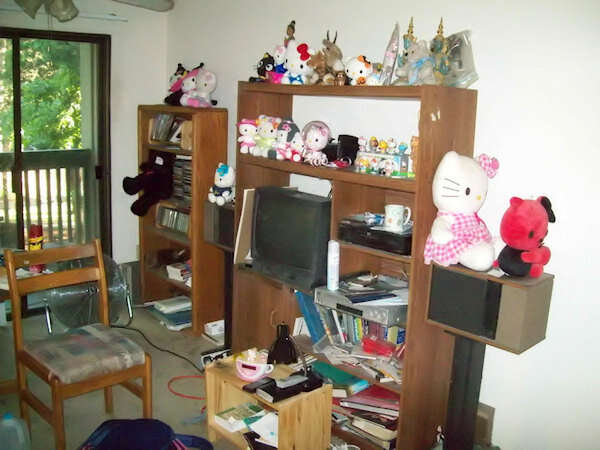 Hmmm...I miss my darned piles of plush, so I will be moving that stuff this way next time I go home (probably spread the move out over a few visits, seems less like overkill and less conspicuous that way ). Sadly, since I'm living in what amounts to a room my grandparents use for storage my snow leopard-ness is not amused. People, however usually do a double take because they're like "OMG BIRD!!' since my parrot takes over the space much more than I do. 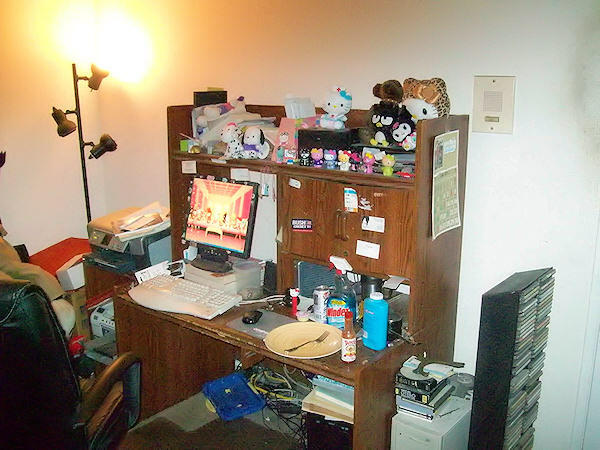 While not exactly fit for my fursona, my room still stands out quite a bit. 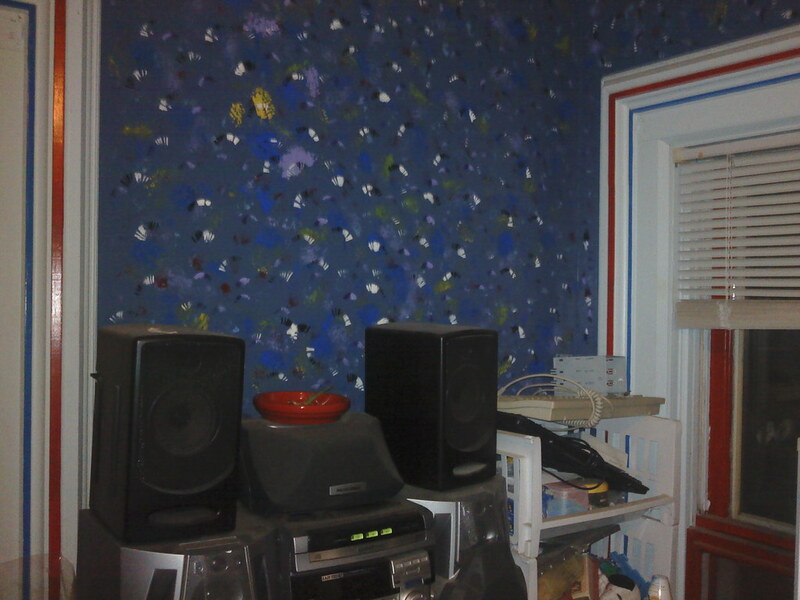 It's completely blue and has a border of fish swimming near the ceiling (it circles my entire room) My drapes are also blue with more fish on them, and I have plastic cutouts of random undersea creatures places on my walls. This would be perfect if I say, lived underwater...which I don't The only other noticeable thing is the random placement of my plushies. You casually walk in and see them nicely placed on my dresser and bed frame, then turn around and go when you see the giant back corner of my room with something like 80 different animals, ranging from beanie-baby size to giant hugable plushies. It's literally a depression in the wall so you can't see it from the doorway. 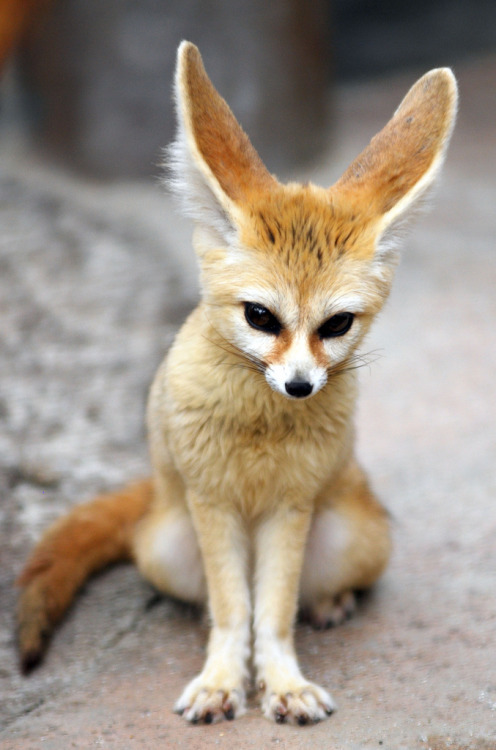 My room's almost fit for a furry...definitely plenty of soft toys lying around (...plenty), blankets, a couple of fox pictures and plenty of other animal ones...all I need to perfect it is one big soft, fluffy, dark orange carpet that would be fit to sleep on. I took some pictures of around my aprtment some time ago. Not everything in my bedroom is furry/animal-related. Either way, apart from my plushies, I have a wolf-themed mink blanket on my bed, two 3D pictures (also of wolves), one beside my bed and the other in my en-suite bathroom, a statuette of a howling wolf on a shelf above my desk, and two Alpha & Omega figures beside it. I don't have a very furry room, as I live with my parents and they have yet to know about my furriness. 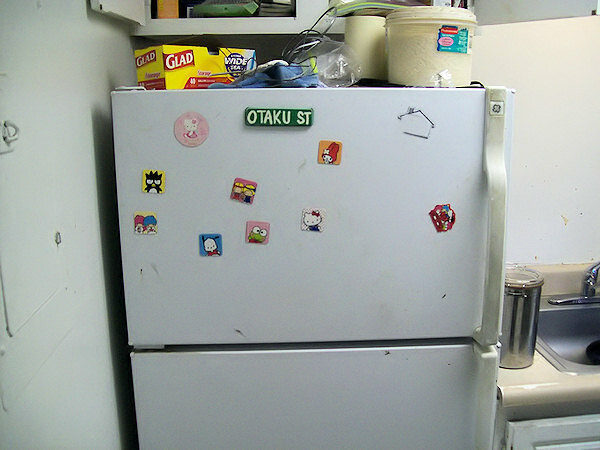 But when I get my own place, it will be more furry. Not an overwhelming furry theme, but enough that I like it and another furry would say, "Hey, this is a cool place ya got here." I don't have any pics of my dorm room handy, but I have a few of my room at home. This is a picture of my stereo, wall, and window woodwork, and this is a more detailed picture of a different section of my walls. 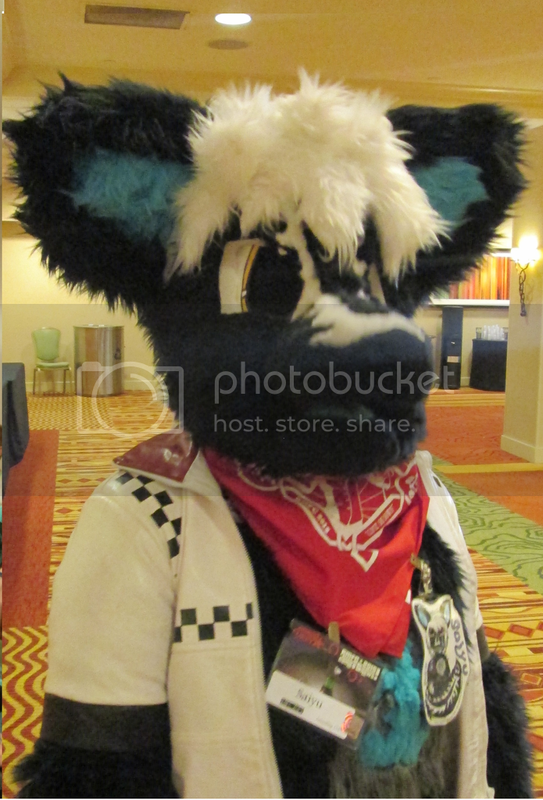 Most of my friends think im in some freaky wolf cult......is there one? I might want o joi...umm....i mean...nothing, i said nothing! My room is cozy, but so full of stuff its not funny. 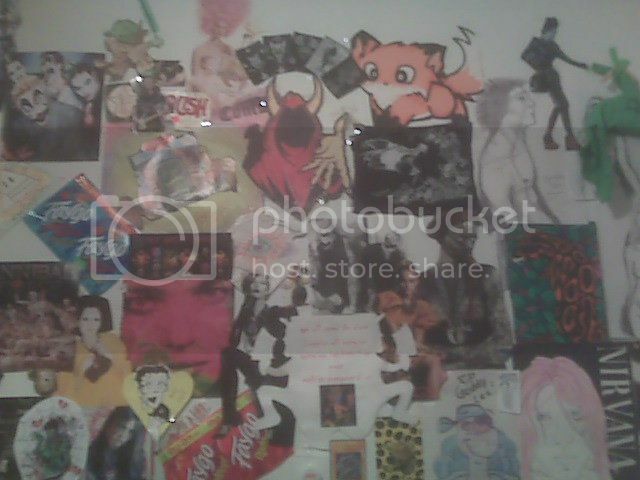 My entire walls are covered with basically a giant collage of stuff.. drawings, lots of zombies, posters, signs (a stop sign and a mph sign), printouts of various foxes and dragons. My bed and closet are full of plushies, my tail hangs proudly near my scarf/hat rack, and I have blue and rainbow Christmas lights hung around the room. 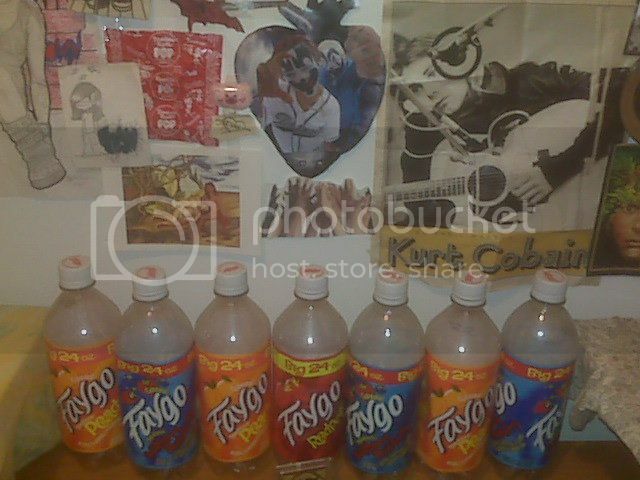 My window is covered with a big tie dye rainbow curtain, and I have some paisely curtains hung around my bed, and a string of rainbow faygo bottles (my fave soda) strung across. 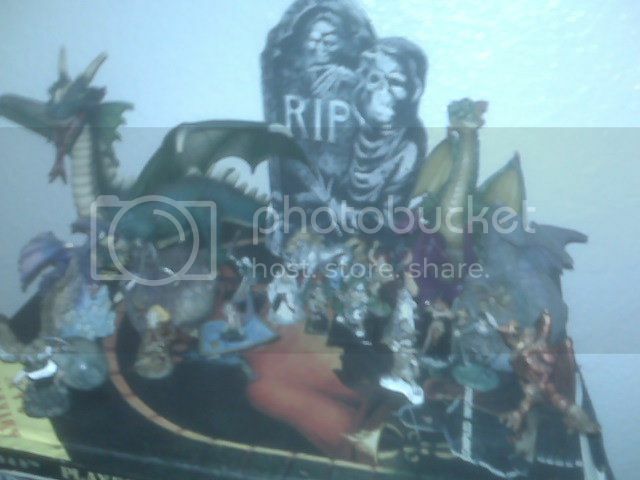 A sketchtable takes of half my room, covered in art of furries and zombies, and my dragon miniatures are scattered throughout the room. 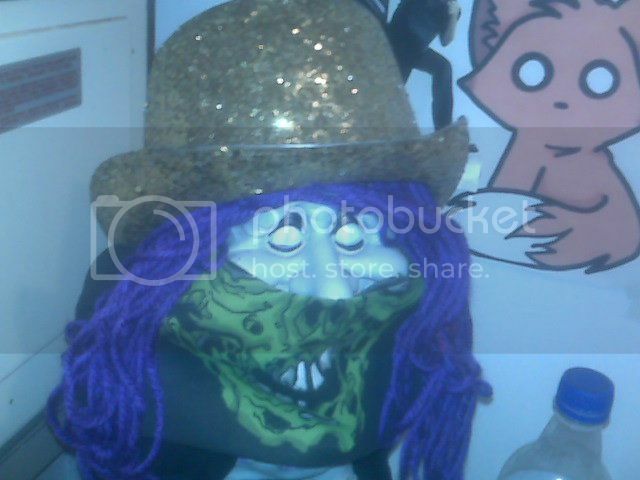 I have an evil troll statue that I drew all over in a corner, wearing my golden sparkly top hat, and an amp, a bass, and two guitars. My room is peaceful and calm. I often get compliments from friends on the atmosphere of it. I have a lot of wolf things, though my fursona is not a wolf. I also have a lot of fur, because I love it <3 and I also work with it (sometimes) outside of being a furry in my art projects. Wolves have an importance to me outside of the furry community, so I think it is acceptable to have lots of it. Being a fox-cat, my cat side demands somewhere huge, comfortable, and fun place to sleep, nap, rest, read, play video games, etc. I always require my bed to be somewhat near or under a window for sun spots or a nice breeze (when possible). To this day, Luna likes to think she has the most comfortable bed ever. 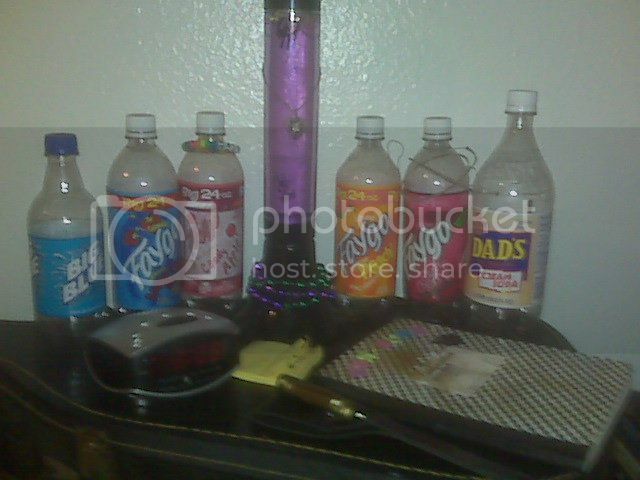 My room is a mixture of...me. Not all based on my fursona, but more of who I am as a whole. A circle. 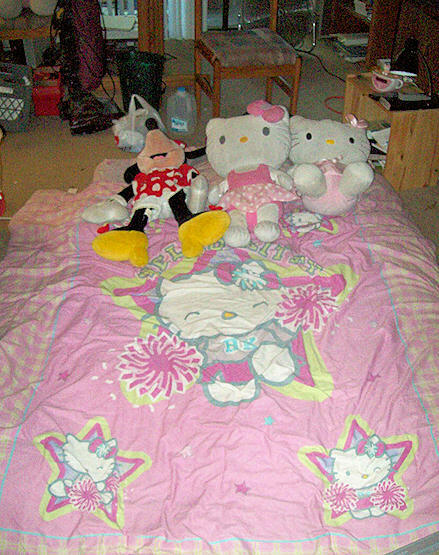 This is a picture I took of my bed at one point for a "photo of the day" thing I was doing. Lol >w<; my bedroom is like almost PACKED with things! 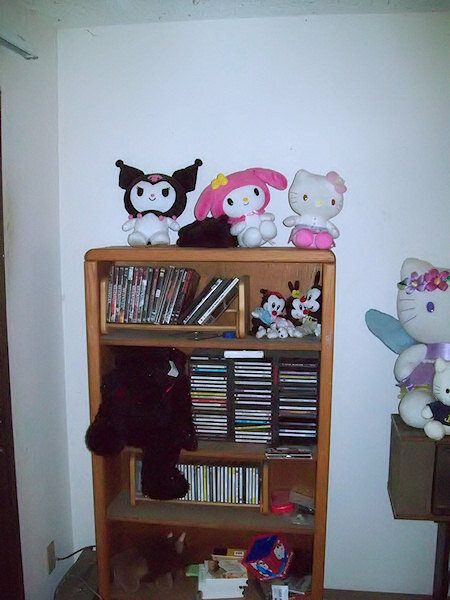 From "posters" to Plushies xD and little knick knack-like stuffies lol and Anime...>> << hmm. Fit for ~MY~ Furry self >w< haha and makes people have a double-look! My room is rather large so my fursona would like that, my only blanket is a giant wolf blanket, i have a rattlesnake skin that my grandpa gave me on the shelf above my TV, and antlers on top of my bookshelf, and of course plushies everywhere. If my fursona had her way, my bedroom would be filled with multi-layered ledges for her to jump from one to the other. 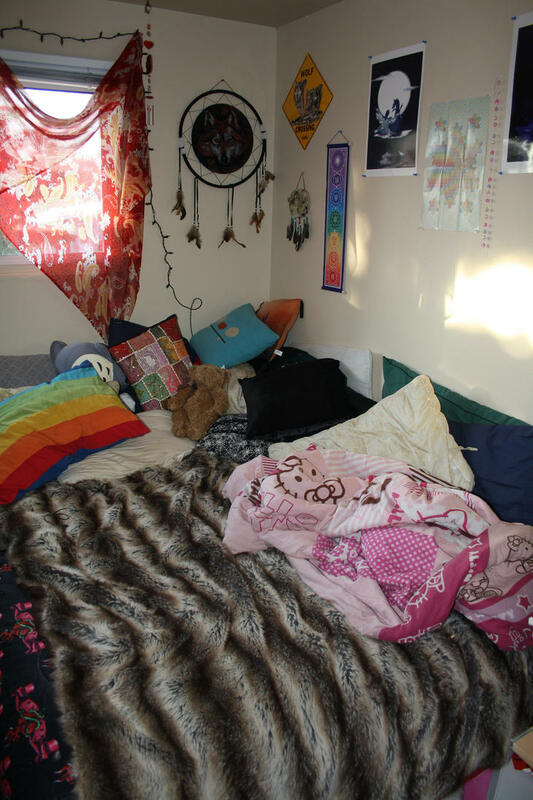 My bed would be a huge round soft, fluffy pallet right in front of the window. I've got a 46 inch water buffalo horn in my room, along with a ringtail cat pelt and a red morph coyote pelt (all humanely/morally/ethically/legally obtained, no comments please if you don't like it). I also have a whole bunch of blankets and a ton of pillows on my bed. I like to make myself a little nest/cave to sleep in all nice and fuzzy and warm. I pretty much sleep on my floor, except when I am forced to sleep on my bed. My desk is where I keep my notebooks and my picture. I also have a huge wolf blanket that I use when it is cold, cause its furry, and a build-a-bear wolf in a leather jacket that I use as a pillow.I pretty much sleep buried under all my stuffed animals, with no space except a breathing hole. My current room has a minimalistic feel. I have a small room, maybe 12' x 8', just by looking at the walls. One corner has a reading chair that's mostly used for chucking my school bag and jacket on, a big bookcase that is full to the brim with books, board games, and random trinkets like my binoculars and junk box of electronic components. On one side of my bookcase I have a small drawer that looks like a bedside table, and on the other I have my clothes hamper. I have a fan by my chair for when it was too hot at night, that I haven't gotten around to moving out of my room. My window and my closet have long, dark grey curtains on them, which block out all of the light in my room; I prefer to have the curtains closed and my computer lamp on rather than use natural light. I have a futon bed, which can change between a 100 degree couch, a 135/145 degree lounge couch, and a 180 degree bed in a snap. I have 8 pictures in a random shape on my wall, all of them sizable (8" x 11" prints in 1' by 1' 4" frames) but one, which is a 8" x 8" frame around the one picture I actually took. All of the others are pictures that my mom took, with my assistance. The wall with my pictures and bookcase is dark grey, the other two with my closet and window are blood red. In the future, I want to hang the recurve bows I get on the wall. my room makes people double take cause it very messy. my room isnt furry, but my dream room would have large windows. the walls painted to look like a forest. a LOT more stuffed animals, and a LOT mre blankets so i can build a den. I dunno if my room is "fit for a furry," but it sure is fit for me. My bedroom is small and cozy, and is also the warmest room in the house. Cats like small, cozy, warm spaces. 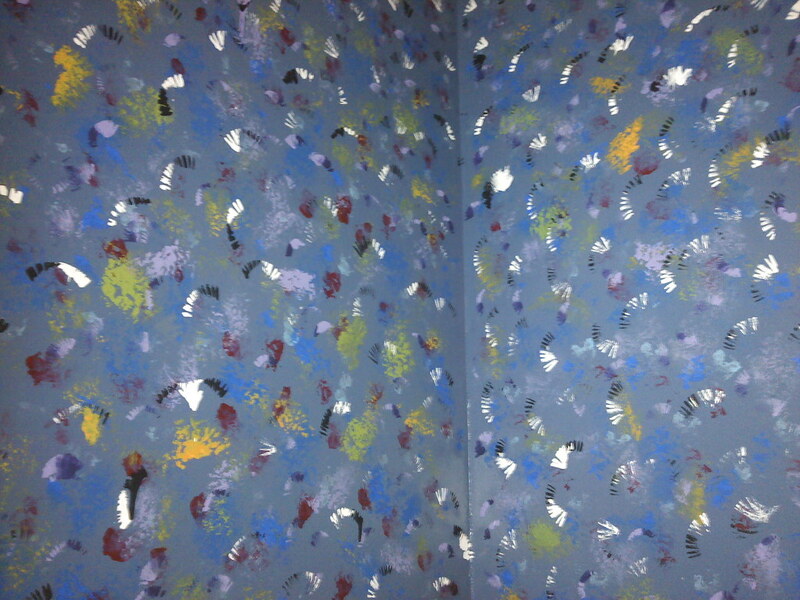 So I guess my room would be good for a feline fursona. Some days I wake up and both of the cats are in my room. 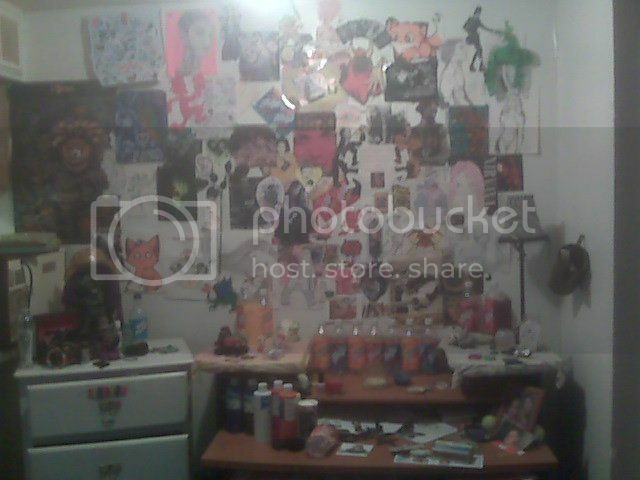 I don't have a bunch of posters or other obviously furry things. My computer desktop has a tiger wallpaper right now though. I also have a blanket with a picture of a wolf on it. That's about it. Regarding the pictures from earlier in this topic... 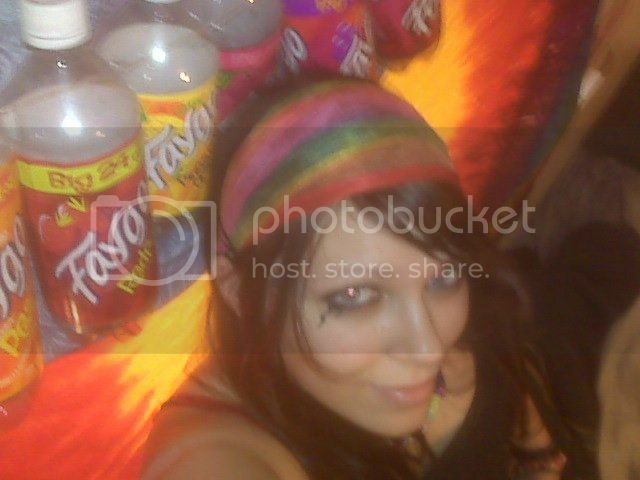 I miss Faygo! Stores here don't sell that stuff.